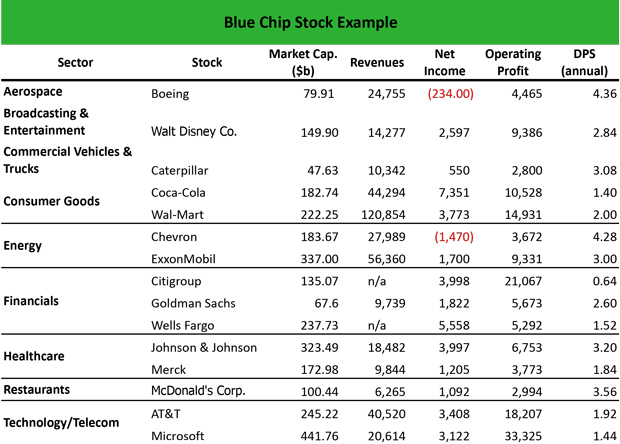 Home » Accounting Dictionary » What are Blue Chip Stocks? Definition: Blue chip stocks are stocks issued by large market capitalization firms, which are leaders in their industries, release strong operating and financial results and consistently deliver dividend payments to their shareholders. What Does Blue Chip Stocks Mean? What is the definition of blue chip stocks? A blue-chip stock is named after the highest valued chips in poker because these companies are the most valuable in the world and have a market cap of several billion dollars. They also have a reputation of excellent performance even during turbulent times, strong history of earnings growth, and strong brand name. Although a dividend payment is not the main characteristic of BCS companies, well established, leading companies typically have a long-standing record of rising dividend payments and increasing shareholder value. Furthermore, these large companies are components of reputable market indexes, including the Dow Jones Industrial Average, the Standard & Poor’s (S&P 500) and others. Most investors consider that owning a portfolio of blue chip stocks is a smart investment move that will compensate them with a high return. However, the key to any investment portfolio is diversification. Examples of blue chips exist in most industries. So, it makes sense to construct a well-diversified portfolio with blue chips of different industries to ensure a growth portfolio but also a relative peace of mind. The table above reveals that, of those companies selected, all demonstrate a high operating profit, which indicates effective cost management and operation. Furthermore, with the exception of Boeing and Chevron that both operate in volatile industries, all other companies have a positive net income, in some cased quite high like in the case of Coca-Cola or Wells Fargo. Although the companies differ in their market capitalization, it is obvious that they are leaders in their industries, carrying a strong brand name and strong financial and operating performance. Define Blue Chip Stocks: A blue chip stock means the stock of a large, brand name company that has a market cap in excess of a few billion dollars and is considered a safe investment for most investors. 1 What Does Blue Chip Stocks Mean?